My most favourite magazine ever is Real Living and I just had to quickly share an image of a really cool vintage style kitchen. 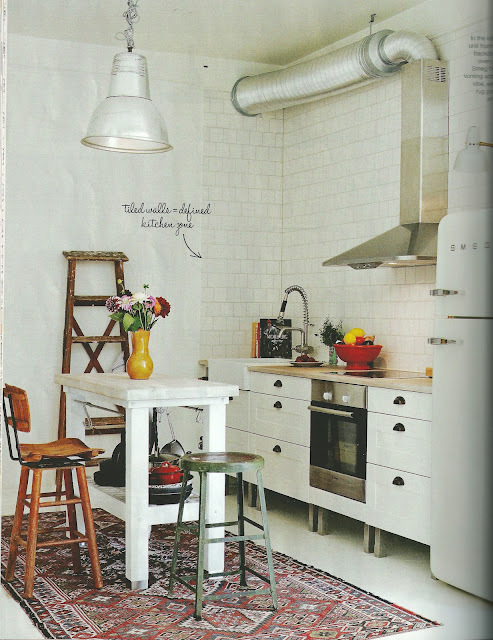 I love the floor rug with the warm red tones and the exposed pipe for the rangehood. This kitchen also has an industrial vibe going - and I am currently really digging the whole industrial interior style trend. This kitchen has a great combination of girl and boy. It has masculine features (the exposed pipe, vintage furniture, industrial light) but also has pretty elements too - like the flowers, the crisp white walls and subway tiles and the sweet fruit bowl. The current edition of Real Living, on sale now,features a story on this apartment - owned by vintage furniture retailer Edin Kjelvertz and his partner, Lina Thofeld. Ooohhhh......and who loves that awesome pendant light?? Me!!! Here is a similar style pendant light from Ikea. 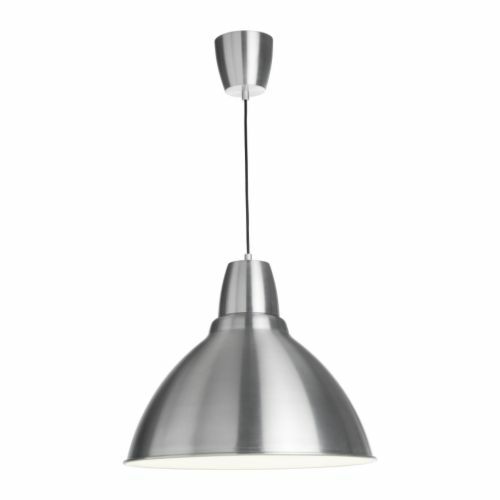 This pendant light (Ikea name = Foto) comes in aluminium, dark grey or off-white. It also comes in three sizes - 25cm, 38cm and 50cm. Prices start from $14.95. Bargain! post and a all round exciting blog (I also love the theme/design), I don't have time to read through it all at the moment but I have saved it and also added your RSS feeds, so when I have time I will be back to read more, Please do keep up the excellent job.